The decision of what oil or medium to use with your baby for massage time is an important one. We recommend a pure cold pressed, organic, vegetable, nut, seed, or fruit oil. These are easily absorbed by the skin and provide additional benefits to your child during and after the massage. As the skin absorbs these oils so easily there will be no oily residue remaining. This means you will not have to wash the oil off afterwards. Avoid mineral oils as well as olive oil, although olive oil is a natural product, its texture is too thick to be absorbed by the skin, so it will not help to moisturise your baby’s skin. Infant Massage Information Services sell cold pressed organic baby massage in the form of vegetable, nut and seed. IMIS oil is free from essential oils, allowing Baby to smell your signature scent, enhancing bonding. IMIS apricot oil deeply nourishes the skin and is an excellent antioxidant. 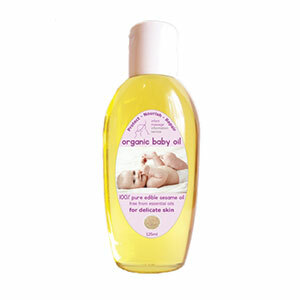 During massage, oil may enter Baby’s mouth so it is vital to use an edible oil. IMIS sesame oil provides anti-inflammatory and moisture retention benefits when applied to the skin. IMIS oil is cold pressed from sweet almonds and is easily absorbed, hydrating Baby’s delicate skin. If you would like to purchase this oil, you can attend one of Baby Perth’s Massage Classes and purchase or directly from IMIS’s website or alternatively send me a message and we can arrange an order for you.